Right now, the residents in our home are feeling the predictable post-Christmas Day poop-out. The gifts are unwrapped. The Nerf guns have been warred with, the gadgets explored. The food consumed. The Christmas tree got rudely escorted off the premises this morning. The ornaments are in their boxes in the basement. It's done. The consumer version is finished, no doubt. But my Daily Lectionary of Bible readings (http://www.pcusa.org/lectionary/)--along with a much-mimicked song--tell me that there are 12 (count 'em, twelve) days of Christmas. We've even got two Sundays of Christmas in the church calendar. I like this reckoning of time; in fact, I'm going to use it. It's always struck me as ridiculous that the ancient Christian view of Christmas has fallen captive to the consumerist shopping holiday. Don't get me wrong: I loved opening my presents and watching my family open theirs. But if all we're left with is unwrapped paper, empty boxes, leftovers, and returns, that's pretty unsatisfying, especially when the reason for this holiday is God taking flesh among us to change all history. So, I'm going to let my liturgical calendar call the shots for the next couple weeks. It's refocusing--it puts a nice bookend on the Advent season which has led up to the Day of Christmas...and it helps with the feelings of let-down. So until Epiphany, Merry Christmas, Day Two to you! 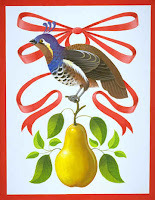 great news, we will look forward to it... and "a partridge in a pear tree"